Martel and his German confederates, not only won at Poitiers but went on to liberate other cities taken by the Muslims in Southern France. His son, Pepin, in 759, finished the job of driving the Muslim invaders out of the lands that would become today’s France, pushing them over the Pyrenees and back into Andalucia, Islamic Iberia. There the Muslims would remain the overlords and occupiers for another 700 years. The war to free Spain from the scourge of Islam was called the Reconquista. It would last 400 years. The general consensus by American punditry was that Obama has now proclaimed the war on terror is over and, by inference, he (not we) has won. He said, “We must define the nature and the scope of this struggle or else it will define us.” Nice rhetorical flourish, Mr. President. But as usual, your words change little on the front lines of this war. They only make our situation more precarious. Recent reports by the Rand Institute and the American Enterprise Institute show that while al Qaeda lost its safe haven in Afghanistan it is operating openly and or has safe havens in Yemen, Somalia, Pakistan, Algeria, Libya, Tunisia, Mali, Mauritania, Niger, Chechnya and even Iraq. Tragically, for those Americans and allies who lost their lives there, Al Qaeda in Iraq (AQI) killed more Iraqi civilians in 2012 than they did in 2011. After America’s complete withdrawal from Iraq in 2011, most of the jailed AQI militants were released from jail and went about violent reprisals against those of their fellow countrymen who had sided with the West. In Iraq, Obama and company have managed to lose everything the West had fought to gain. Meanwhile, one of the groups fighting to depose Assad in Syria, Jabhat al Nusra (Front for the Victory) is indistinguishable from AQI. If Syria falls to al Qaeda militants it will be the realization of the bin Laden’s long-held dream to reestablish the Caliphate in the Levant, on the doorstep to the West. Obama wasn’t finished emboldening our enemies. 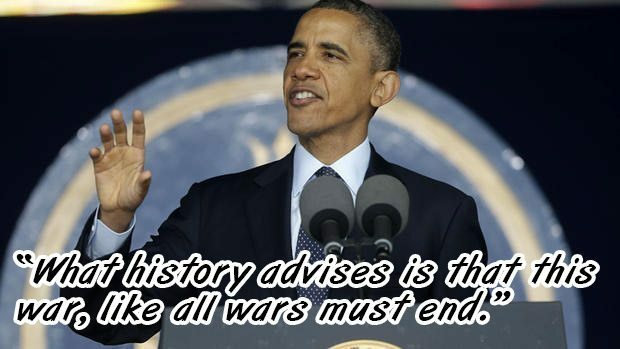 At the Naval Academy he proclaimed, “What history advises is that this war, like all wars must end.” If this statement were not made by America’s Commander in Chief, the man who is in charge of the preservation of western civilization, it would be laughably absurd. What if Ronald Reagan proclaimed the cold war over in 1981 because we had been waging it for over 30 years, and because it threatened to “define” us? What if the Catholic Spaniards, after 400 years of war were worried about the Reconquista “defining” them? Answers: Today the Soviet Union would be siding with Iran and Syria and the West would contain an Islamic Spain. “Appeasement of an outside power always invites aggression. In his commencement addresses, our president made it clear to our Islamist enemies that we in the West do not have the stomach for long wars and that all they have to do to win is wait us out. I fear it’s a dangerous message that will get people killed. The Treasury Department yesterday identified six al Qaeda members as Specially Designated Global Terrorists. These six terrorist operatives form a network that funnels money and personnel from the Gulf to Iraq, Afghanistan, and Pakistan via Iran. The head of the network, Syrian-born Ezedin Abdel Aziz Khalil, operates from inside Iran with the full knowledge of the Iranian regime. Al Qaeda’s presence in Iran and its operatives’ links to the Iranian government and Islamic Revolutionary Guard Corps (IRGC) were known to exist prior to this designation. In the 1990s, al Qaeda associates negotiated an agreement between Osama bin Laden and the Iranian government that allowed the transit of al Qaeda operatives through Iran into Afghanistan. According to Treasury, Khalil, who represents al Qaeda in Iran, has run the current network since 2005 “under an agreement between al-Qaida and the Iranian government.” The network is “the core pipeline” for moving money and personnel from the Middle East into South Asia. And so we’re to believe our president when he tells us the war on terror is over?